Sometimes Sublime Sights appear completely out of the blue. The well-known scholar Timothy Wilcox recently sent me a photograph of the watercolour reproduced below. It forms part of an exceptional private collection which Tim is cataloguing for publication in due course. It appears to have been acquired as a Turner by an ancestor of the present owner, but was not included in Andrew Wilton’s catalogue of Turner watercolours published in 1979. Wilton worked through the collection systematically, and presumably rejected this example, and it has languished in the margins of the collection ever since. I had not seen it before, but it occurred to me that it might relate to works that I studied for the exhibition of ‘Turner, Mont Blanc and La Vallee d’Aosta’ held at the Archaeological Museum of Aosta in Northern Italy in 2000. I can now offer an identification of its subject and occasion, and propose for it an unsuspected importance. This is a rapid and energetic watercolour sketch of an Alpine valley. In the left foreground a wooden bridge crosses a torrent to a few houses backed by steep slopes. The water flows away to the right down a valley closed by a snow-capped peaks. Beyond the bridge a ravine apparently disgorges an avalanche into the main river. The details are made out directly in watercolour over a few sparse graphite indications, and the sketch shows every indication of having been made direct from nature. The subject can be identified as the Ponte de la Villette which spans the Dora Baltea a little way above Courmayeur near the head of the Val d’Aosta. The view spans an angle of view of 90 degrees, sweeping round to take in the view down the valley towards the distant peaks of the Monte Colmet range (3024m). The modern bridge is a single-span concrete deck. When I explored the area in 1999, I was unaware of the present watercolour, so took no photographs from the exact viewpoint. I did, however, take one of the modern bridge, looking downstream to Monte Crammont. That photograph more-or-less continues the view of the present watercolour to the right. Turner visited the area in 1836 on a tour to the Alps in the company of his Scottish patron Hugh Andrew Johnstone Munro of Novar. The story is told in full in ‘Turner, Mont Blanc and the Val d’Aosta’. Briefly, they travelled to Geneva and explored Lac Leman before taking the Arve valley to Mont Blanc and its slopes around Chamonix. They then proceeded by mule and on foot around the modern-day route of the Tour du Mont Blanc, crossing the Cols du Bonhomme and de la Seigne to Courmayeur. From there they travelled south down the Val d’Aosta to Turin, and Turner’s return journey took him over the Mont Cenis pass to Lanslebourg and Chambery. I have written about a subject from earlier in the same tour for a previous article on Sublimesites.co (‘Turner at Sallanches, 1836’, 19 March 2015). The trek from Chamonix to Courmayeur is three days of hard work, albeit across a sublime landscape of snow-strewn passes, avalanche-swept couloirs, past a succession of aiguilles and high snow peaks, together with several glaciers, not least those of the Miage and Brenva sweeping down from Mont Blanc to the Valle Blanche on the final descent to Courmayeur. Turner rested up at Coumayeur, perhaps for a few days, and made a series of sketches both in pencil and watercolour at the head of the valley, around Courmayeur itself, and at Pre St Didier, slightly lower down the valley, where he no doubt took full advantage of the famous hot springs and bath house, in continuous use since at least Roman times. In 1836 the Ponte de la Villette was a distinctive wooden construction and it appears in several pencil sketches that Turner made in the sketchbook that he carried with him, the ‘Val d’Aosta sketchbook’, now part of the Turner Bequest at the Tate Gallery, London (TB CCXCIII). None show exactly the same view. The bridge is most recognisable in f.23a, where it is seen at the bottom right, in a view taken from the left bank of the Dora Baltea, looking down the valley with the tower of Courmayeur church at the left edge. The sketch shows the Monte Colmet range in the distance with Mont Crammont to the right. Downstream of the Ponte de la Villette we can see the Pont de Dolonne, with the village of Dolonne on the higher ground to its right. Turner recorded a similar view down the valley in f.37, but from a viewpoint slightly further downstream, with the Pont de Dolonne in the foreground and much the same material as the watercolour in the distance. Co-incidentally, given my previous article on the 1836 tour for Sublimesites.co, the sketch at the right edge of this sheet records a view of Sallanches. Turning over the page to 37 verso, Turner recorded the view from the same spot, but looking in the opposite direction up the valley to the Mont Blanc range. The Ponte de La Villette appears in the foreground, lower right, and the viewpoint of the present watercolour at the top of the bank at the right hand edge. Besides the present watercolour, Turner also made a leisurely and tranquil watercolour sketch of the view looking down the valley. For this he found a viewpoint slightly further up the valley than any of the other sketches, looking downstream towards Courmayeur. The Ponte de la Villette is visible in the right centre distance. The present sketch, however, is anything but a straightforward representation of the topography. Turner used the pencil sketches to detail particularities but the watercolours for effects and ideas. The most remarkable effect here is the torrent falling down the ravine above the bridge and overwhelming the river below. This is an apparently catastrophic event occurring in an otherwise untroubled landscape, and, devastatingly, appears to have completely erased Courmayeur in its passage. Such events are not uncommon in the Val d’Aosta. I myself escaped the valley only a few hours before the cataclysmic flood of 13-16 October 2000 cut off most of the main routes of access. There were inundations and landslips everywhere, several lives lost, and ruinous damage to property, industry and agriculture. As I write this in 2018, not far from the spot depicted in Turner’s watercolour, the Montagne de la Saxe threatens to release anything up to 6 million cubic meters of rock and earth into the valley below, not least threatening the village of Entrèves and the entrance to the Mont Blanc tunnel. Turner had passed ongoing scenes of avalanche, glacier and rockfall on his way across the flanks of Mont Blanc to Courmayeur. When I walked the route from Chamonix in 1999 there was evidence of a recent avalanche at Les Chapieux that had passed with such focused power that it had taken half a building away in splinters, whilst leaving the remainder almost untouched. In 1836 Turner would probably have heard the story of the massive rockfall at Triolet in the Val Ferret not far from Courmayeur which during the night of 12-13 September 1717 had wiped out whole villages and killed the inhabitants and their cattle. So as Turner sketched at the Pont de la Villette in 1836 his mind would have been racing with stories and memories of tsunamis of rock and ice. The whole point of this sketch appears to have been to project these thoughts onto the landscape. Although there are the regular talus slopes found all over the Alps, there is no especial evidence of such an event actually occurring at this very spot, still less before Turner’s very eyes. The ideas had taken root in Turner’s imagination and the following year he exhibited one of his most apocalyptic compositions under the title ‘Snow-storm, Avalanche and Inundation – a Scene in the Upper Part of Val d’Aouste’. Art Institute of Chicago, Chicago, USA, Frederick T Haskell collection 1947.513. All of these are 1836 sketches, but are of quite unrelated Val d’Aosta subjects, and not at all comparable in terms of composition. Perhaps it seemed that the composition had sprung too much from the wilder recesses of the artist’s imagination, so any proper contextualisation of the painting stalled in limbo. Here, however, we can see that the exact composition of the painting is rehearsed in the present sketch, together with the precise idea of some grand debouchement. The painting was bought by Turner’s travelling companion, H A J Munro of Novar, and when in 1878 his collection was sold by Christie’s the catalogue stated: ‘When the sketch was made for this picture Mr Munro was with Turner, who expressed a hope to him that he (Munro) did not know what he proposed to paint, for if so, he should feel himself obliged to abandon the subject’. Now that the sketch in question can be positively identified, an important window opens up into the working of Turner’s imagination in the very act of sketching. Turner no doubt witnessed torrential thunderstorms in the Val d’Aosta. On one of my photographic visits ahead of the 2000 exhibition I remember the clouds gathering at the head of the valley, and by the time I parked up in the square at Courmayeur the air was chocolate brown in colour. It was like being submerged in a gigantic café latte. There is a Turner sketch showing what appears to be exactly this phenomenon amongst the work made at Courmayeur in 1836. When the rain came it fell in torrents. I doubt that mine was anything but a run-of the-mill thunderstorm, but trapped inside a Fiat Punto, one could easily imagine floating off on the stream flowing across the tarmac, along with the coffee-cups, rubbish bags, leaves and occasionally a reasonable branch into the weltering gloom. After about an hour it brightened and the carpark was a shallow lake, and the tributary streets slewed with stones and gravel. In Snowstorm, Avalanche and Inundation, Turner imagined what it must be like to be in a properly serious event. 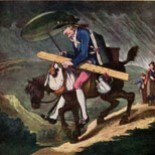 In the foreground of the picture a group of woman struggle to save a chest of belongings from being swept away. It must have felt something like this to those trapped in the valley during the inundation of 2000. The storm continued for days, and at its height over 60cms (two whole feet!) of water fell in a 48 hour period. Eighteen were killed in the Val d’Aosta alone, and overall 40,000 had to be evacuated and 3000 were rendered homeless. Inevitably perhaps, the critic hoists himself with his own petard. Turner wasn’t making ‘pictures’ in the sense that would have gratified the usual promenaders at the annual exhibitions. To speak of such things as were intimated to Turner by the Alps in 1836 required the abuse of such expectations and of the language by which they were customarily served. This entry was posted on March 31, 2018 by Professor David Hill in Turner and tagged Alps, Aosta, Courmayeur, Italy, J.M.W.Turner, Turner, Val d'Aosta.